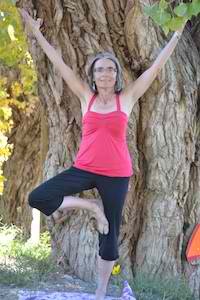 Marcia Ludden invites students to the joy and strength of yoga that she experienced when beginning her practice in 2001. Thinking that yoga would be a wonderful cross-training exercise for tennis, she gradually learned the benefits reach far beyond just adding another physical activity to stay healthy! Back fusion with two Harrington Rods to correct a 90 degree right thoraco-lumbar curve provided some challenges along the yoga journey, but the pain relief from over-stretched, tight muscles was worth the effort. 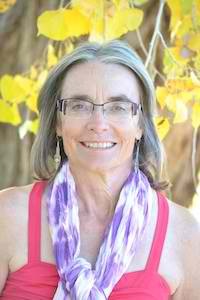 Marcia is a graduate of the 200 hour Yoga Teacher Training at Asana Studio in Golden, Colorado, and has completed the 20 hour training and practicum with Elise B. MIller to obtain Certification in Yoga for Scoliosis. She has taught Vinyasa and Gentle Yoga classes in Colorado, and teaches series Yoga for Scoliosis classes at Bhava Yoga in Albuquerque, NM. Having an M.A. in Vocational Rehabilitation Counseling plus 35 years experience in the field, provides insight and knowledge of how to overcome the impact of physical and emotional challenges when practicing yoga and other activities. Helping students with scoliosis discover their practice potential, reduce back pain, and develop the subtle body/mind connection is key when Marcia works with private clients. Her own yoga practice is essential for her active lifestyle which includes hiking, snowshoeing, tennis, golf and gardening. Marcia can be contacted by calling 303-277-9593 or by email at: marcialudden@hotmail.com.